I really can not stand this calm...is it calm before the storm, or calm as in every important person is in a very important meeting (buying or selling furiously)..not sure. So mean while lets list and enjoy these beautiful coins with beautiful faces on them. I will encourage all of you to bring out the romantic side of the people - who designed these chinese coins not fearing the domestic backslash! I think this one is sooo beautiful! DING DING DING !- We have a winner ! Will somebody, somewhere, please PM me and offer me one ? OMG ! Yes, I agree. I'll trade the 1995 Peace for one of those! Here's specially for you Underbidder. Whenever I see the Yellow River one, I keep thinking to myself "I hope there's no anchovies on that pizza". Total of 8 UNEP coins NGC graded. 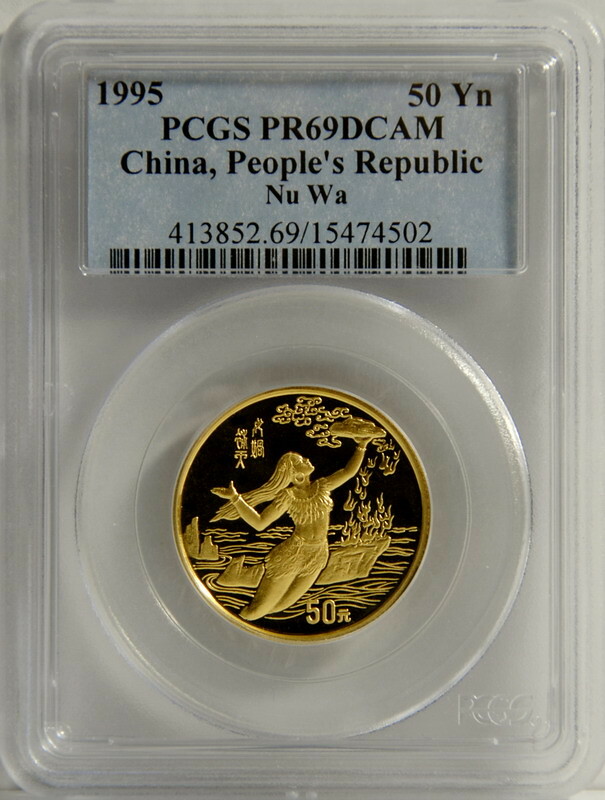 5- PFUC69, 3- PFUC70..
and looks good out of the capsule even when overlit--Wang Zhaojun. The 1992 Wang Zhaojun has unusual concentric polishing lines which I think is the artifact from pantograph reduction die making process. Please see the picture I posted here: http://china-mint.info/forum/index.php?topic=6403.msg38971#msg38971 It is hard to see it on your photo, but all three of mine have the artifact and they don't seem to affect the grade. That UNEP coin is indeed a beauty, one with water varieties, too. I could not find any concentric polishing line on my Wang Zhaojun pictures. I will take a closer look when it comes back from Sarasota. It does tiny radial lines, maybe from metal flowing outward upon striking the planchet. Pantograph reduction may explain a concentric line I have seen on another coin I have. I had thought that maybe something in the capsule half rotated could have made the line. 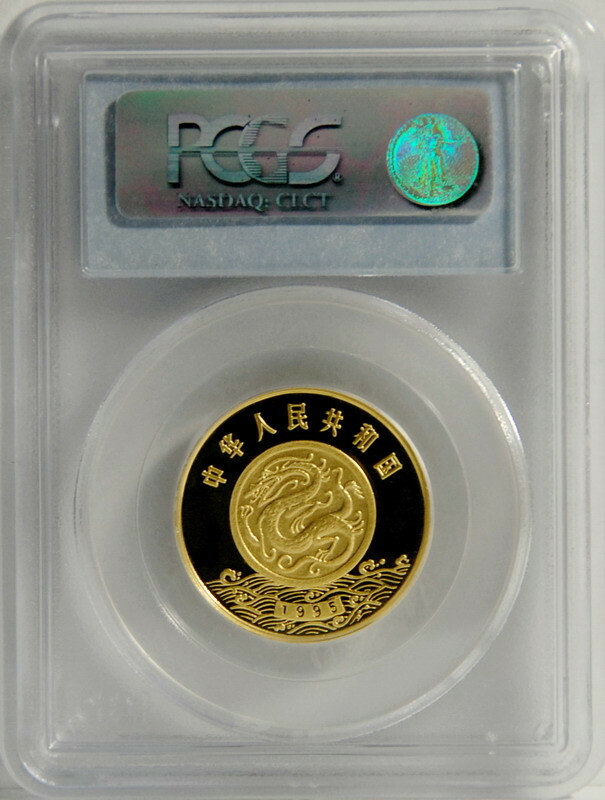 Here is a beautiful Huang Dao Po coin which graded PF 69 Ultra Cameo. the cut of her outfit, or just the way she was built. This is my five ounce Silver version of the Sinkiang Autonomous Region beautiful woman medal. Conservation improved her but some stuff remained. She is PF 64 Ultra Cameo--a little rough, not gem. I found another Wang Zhaojun picture in my collection. 69 Ultra Cameo by NGC and is seen through the slab. Your left picture shows the concentric lines quite clearly. I annotated your picture with three concentric rings to show the more prominent lines (there are many, many lines if you look carefully). The outermost ring cuts across the chest of the camel and sheep; the middle ring cuts across the robes of the gift bearers; and the inner ring cuts across the right forearm of Wang Zhaojun. Yours is the mirrored version of Wang Zhaojun so the concentric lines are easier to see and photograph. The frosted version of Wang Zhaojun is difficult to photograph but the lines are there, you just have to tilt the coin around to find it. My 3613749-006 is also a mirrored version and it shows the two outer concentric rings in the same place as yours (pointed with arrorws). I took it out and look at it again just now and the inner ring is also there in the same place, although not easily seen in the attached photograph. IMO, illuminate a woman's face in front of her or slightly above her shows her beautiful features the best. This is another Wang Zhaojun photographed with diffused light in front of her. OK, Those concentric lines certainly are there--excellent illustration. coins and medals with faces. been looking at the features as well. lines mentioned in the other items now. I didn't do a good job when it comes to the breast size imbalance, but her beautyful face comes to light and some of the details in the background are quite well captured imo. That is an excellent angle and lighting for bringing out all details. Nothing is blown out by excessive light or dark. Her body looks balanced and she has such a sweet face. Many 1989 Huang Daopo has broken or thin threads as pointed by the red arrows in the attached picture. ( http://china-mint.info/forum/index.php?topic=4585.msg27600#msg27600 ) This is the first time I see one with thin thread in the area pointed by a green arrow. Is that the effect of lighting or is that real? Thanks for making me aware of the HF thread, very interesting read and also the broken vs. Non broken. Mine appears to be broken, but at *40 there is a very thin thread connecting it. To answer your question, it must have been the lighting, that made it look thin. Here is a daylight pic of the same coin. nice! I like your way «AllSsong, I am a fan..
Dragon Fan & jwa1inv: thanks to both of you for your kind words Much appreciated. Pandapaul's Princess Wang close up pic is really nice, makes me want to add one to the collectio. The one I posted is the only coin with a women in my possession so far. Here are two 1992 historical figures from the collection with clear concentric lines which are artifacts of pantographic transfer. The 1994 silver unicorn als have these concentric lines. They definitely made great coins in the 80s and 90s! Page created in 0.173 seconds with 70 queries.